How can I get TV in a second room? Let’s assume you have digital TV on the main telly in your house. This could be with a set-top box, or from a TV set that has Freeview built-in. If you don’t yet have digital TV on your main TV set, see our Digital TV Options page. This option will save you the expense of having to buy a second set-top box. Normally, this will mean running an aerial cable from the output of your main set-top box, to the aerial input of your second TV set. NOTE: There is one big drawback with this option – and that is that your second TV set will only be able to watch the output of the TV receiver in the main room. As an example, let’s say you have a Sky Digital box in your lounge, and it’s set to Sky One. If you connect an aerial cable to a second TV set, the second TV set will only be able to watch Sky One via that connection. Change channel on the main box, and the second TV changes channel too. For this option to work, your set-top box must have an RF aerial output socket (to accept a plug like the one pictured). Also, the set-top box must have something called a modulated output (which means it can re-transmit a signal to a second TV set). Boxes from Sky Digital, Virgin Media and BT Vision (grey models) have these, as do some Freeview boxes. 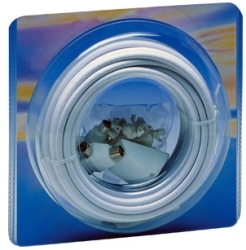 Aerial Extension kits: To connect, you need to run a co-ax aerial cable from the back of your set-top box to the aerial input on your second TV set – you can get cables, connectors and extension kits from Maplin and Argos. See below for an example of an extension kit. If you don’t want to use a kit, you’ll need a suitable length of co-ax cable, cleats to nail the cable to the skirting board and one co-ax aerial plug for each end, plus a way of splitting or boosting your existing aerial. Tuning in: Once you’ve made a connection, you need to tune the TV set into the output of the set-top box. You need to make sure that the set-top box modulator is turned on (Got Sky? See Sky FAQ). Multiple TV sets? If you’re feeding to lots of TV sets, or have a very long cable run, you may need either a splitter or booster (from Maplin) to allow you to split and amplify the aerial co-ax output without too much quality loss. Don’t want to run cables? If you’d rather not run cables, consider a wireless video sender – these connect to a spare SCART socket on your digital TV set-top box. Again, these can only transmit whatever channel your set-top box is tuned in to. Wireless AV senders are available from Maplin.co.uk. See our Video Senders page for more on AV senders. Purchasing a second set-top box for the other room is normally the more expensive option, but it does give you the flexibility to watch a different digital TV channel in each room. Virgin Media: Virgin will be happy to sell you a second V Box – Order at www.virginmedia.com. BT Vision: You can’t have two BT Vision boxes connected to broadband at the same time, so getting a second BT Vision box won’t do you many favours. As BT Vision gets its live TV from Freeview, a second Freeview box may be all you need. Quick question.I have just bought a TV with satellite build in with no RF out. I still have my old satellite receiver so I have decided to connect it to my second TV upstairs. The only problem is that I can’t run any cables (apart from the one that I have already)through the wall. Can I can connect my receiver (I will leave it downstairs) and my TV (upstairs) just with the RF loop? If you have decided to take your sky digi box upstairs to use in ur bed room. You will need one digital coaxial cable with a f connector to go from the lnb on ur sky digital dish down to the back of your sky digital box then a scart cable going from TV out on the back of sky digital box to scart in on the back of your TV. Then switch on bedroom TV an tune it into what channel your sky digital box is broadcasting showing IE 401 Sky Sports one. I want to install a 6-way aerial signal booster, to feed signal to TV’s in different parts of the house (and leave spare sockets for future additional TVs). One of them will be around a 30m run away from the booster, located in the loft. I have seen a box to buy, and the spec quotes Output gain of 12-15dB, with Noise of <=3.5dB. Will this spec be strong enough to push a strong enough signal to the farthest TV, for viewing Freeview? I already have 2 TVs connect to a smaller signal booster and the picture quality is perfect. How do i install a tv plug in amplifier? can I get more freeview channels on my freeview tv if I connect a freeview box. I have a M8 TT tv box with kodi etc, all connected via HDMI cables. I have purchased a oneforall SV 1730, and I can’t seem to get it to work on my second TV in the kitchen. The oneforall is connected to my smart TV in lounge and the receiver is connected to kitchen TV all by scarts. The chap in Currys assured me that whatever was on lounge TV would show on kitchen TV but I don’t have anything…please help. gd day.pls i hav dstv satterlite dish nd box likewise startimes and want to be whahing dsame challels inside my other tv i hav in my inner room. dat means where i can get av chnners to connect my cable tv inside d sitting room to my tv in d sitting room.is it possible to buy on line or where i can buy in nigeria shop. pls can i watch in one decoder or receiver more than 1 television? Not sure if you can help, i am after a device which can enable me to listen to British radio channels on my builders radio while working in the barn. I can get radio channels on my sky box, but it is around 45m away from the barn. I am looking for a gadget to boost it to my radio. I’ve decided after many years of trying to extend TV circuits myself, its worth it in the long to get a professional in and do this for me. Now that many programs in broadcast in HD it is well worth getting a good signal in order to appreciate the benefits of HD. No point buying a good quality HD TV if you are not going to get a signal to match. If the aerial has a male connector and the foot of the T or Y also has a male connector how is this possible. I know it’s kinda old thread, but I really could use some help. Can’t get it by googling everything I thought about. I have cable tv provider to my house. 2 TVs are connected to main SetTop Box via cable splitter. So, one coaxial cable goes to splitter, and two cables go from the splitter, each to its own TV. Now, my problem is, whenever I turn off LG tv, my Samsung tv in the other room loses signal for all the channels. If both are turned on, signal is great on both of them. If I turn off Samsung, LG does NOT lose signal. I tried switching the cables on the output of the splitter, but nothing changes. What can I do? Also, when i plug off the cable from LG tv, my Samsung is able to search for channels and has great signal. As soon as I plug the coaxial cable back into LG and its is turned off, Samsung loses signal. Please, anyone, help me. Personally I’d run separate feeds to both TVs ( use 2 cables not a splitter) eliminates that problem. With the help of this article, You can easily watch TV in the room. it is a very important post to me. And in this, you provide the technic which is very helpful to me. so, I am using the Apple TV which is working very good. if I have any problem when I go to the website https://applesupportnumber.net/apple-tv-support/ which provides the best support. This post is really good.